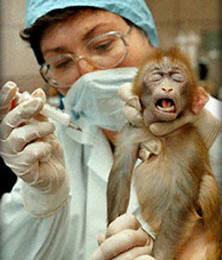 First and lamentably, the law currently poses almost no threat at all to animal research. To the extent that laboratory animals have any protection at all (and most don’t — mice and rats, the most popular lab animals, are exempt from the paltry protections of the Animal Welfare Act), virtually no one has standing to enforce those protections. So Mr. Conn’s concern seems unfounded. Second, Mr. Conn seems chiefly worried that animal law courses which teach “animal rights” could “set up adversarial potential on campuses.” He says that “[f]ailure to address developments in the education of law students is likely to have a long-ranging impact on the ability to develop new treatments needed for human and animal well-being.” This seems like suspect logic as well. The primary demonstrators against vivisection are almost certainly not animal law students or even law students (or lawyers) at all. His fear of animal law more likely stems from something else. Does he not want animal law courses taught because they might cause a critical reevaluation of vivisection? Does he think we should keep law students from thinking about such things? Does he wish to similarly cabin bioethics courses? If he would answer yes to any of the above (and I would guess that he would probably answer yes to all three), then the threat he perceives to his field does not reside with animal law. He rather fears that his discipline cannot withstand ethical scrutiny. Consequently, he wishes to wall it off from review and give it an ethical pass in the name of science. Articles like his, which use scientistic rhetoric to cloak a narrow insularity, threaten not just the animal cause but all education. Knowledge can be dangerous. But more dangerous still would be to give over to so-called experts the ability to determine what we should and should not learn. And so we have Mr. Conn, who warns ominously of catastrophe arising from a “failure to address” developments in legal education. I wonder how he proposes to “address” law students’ burgeoning interest in animal law. Whatever it means, I say: Bring it on. I will continue to teach animal law and I look forward to the day when Mr. Conn and his ilk actually have something to fear from it. This is very disturbing! It hearts to watch! This makes me SICK!